Moray Foodbank in Elgin, Moray. Picture by Jason Hedges. Figures published by the Trussell Trust revealed that more people in the region are being forced to use foodbanks in 2018 than 2017, with 1422 emergency food supplies given to locals between April and September this year. That figure compared to 1200 in the same period last year. Statistics for the whole of Scotland also highlighted a stark rise in usage, with numbers increasing by 15%. Food bank providers have claimed this is largely due to the in-built minimum wait of five weeks for a first payment for those put on Universal Credit – with many more people forced to wait even longer than five weeks. 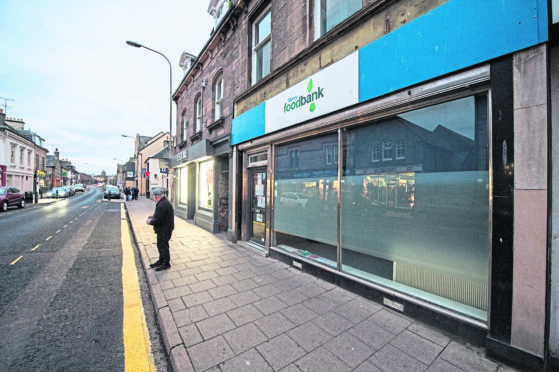 Moray Foodbank on Elgin High Street helped 2759 people in Moray during 2017, and is currently running a reverse advent calendar appeal which has the organisation request certain items that they are need donated every day in November. Moray MSP Richard Lochhead was scathing about the increase in demand which he blamed on austerity policies imposed at Westminster. He said: “These are truly heart-breaking figures for Moray, which bring into sharp focus the devastating impact the Tory government is having on people in on our local communities. “The fact that food bank use is growing across Scotland is a damning indictment of UK government cuts to welfare, and the botched roll-out of Universal Credit. The Trussell Trust run a network of over 420 food banks across the UK and provide emergency food to people in need. Emma Revie, chief executive of the trust, believes the government needs to act quickly to fix the problems with the Universal Credit roll-out. She said: “It’s not right that people are being forced to use food banks after weeks of waiting for Universal Credit payments.